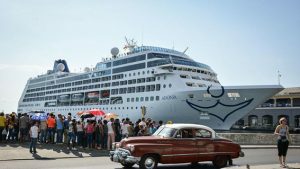 Despite recent reports that Fathom, a subsidiary of Carnival, was to drop Cuba from its itineraries, the company has just announced that it will be running another six 7-day cruises to Cuba and the Dominican Republic, from February through May 2017. The Cuban authorities have given permission for Fathom’s Adonia to include stops at Santiago de Cuba, the island’s second largest city. With so many cruise ships now suddenly being allowed into the once-restricted waters, it will be interesting to see how the island and its facilities cope with sudden influxes of tourists and travellers hungry to see how the island has survived. Will it manage to retain its historical integrity or will it all become cheapened and commercialised? Only time will tell……..